1. The Bocado Burger. Said to be the closest competition to the legendary Holeman + Finch burger, Bocado has paid special attention to every delicious bite of their burger. Such attention did not go unnoticed as their burger was named Creative Loafing’s “Best Burger” of 2010. Bocado even began offering “The Wimpy”–a plate of 3 burgers. I always thought they should give away a shirt for the brave of heart (and artery) who decided to undertake and devour The Wimpy. 2. FLIP Buckhead. After much success with their Midtown location, the FLIP guys (Richard Blais and others), decided to bless Buckhead with a burger boutique. Opening in October 2010, this FLIP locale has had its share of growing pains, but nonetheless remains a go to on Roswell Road for diners craving a burgers. 3. Yeah! Burger. Shaun Doty ceased operation of his non-burger restaurant, “Shaun’s”, presumably to focus on his burger joints, located in Midtown and Virginia-Highlands. Beef, Bison, Turkey, Veggie, Chicken, Yeah! has it. If you are so lucky to be aware of Yeah! Burger’s secret menu (www.yeahburger.com/secret — you’re welcome), you know they even have $1 sliders on special. Many of Downtown Atlanta’s finest dining establishments were selected to take part in this fabulous food event. There are no passes to buy, coupons to carry or cards to punch. You simply attend the restaurant of your choice during Downtown Atlanta Restaurant Week and select from a special three-course dinner menu, for $25.00 and $35.00 per person, plus tip, plus tax*. Book your reservation today by clicking here. We’ve picked a mix of classics, favorites and bests — a list that will help you navigate our city in all its gastronomic glory. We also asked a few chefs around town to pick one dish they’d eat before they die— one took the question quite literally — to find out what the professionals hunger for. So dig in — first reader to complete the list wins a heart attack and boasting rights. Print off a checklist of the 100 dishes so you don’t miss a single bite. 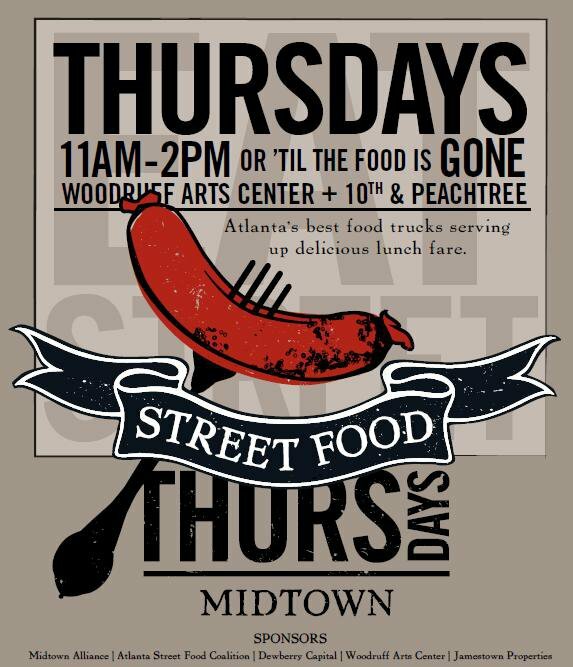 Midtown ATL Presents: Street Food Thursdays….Grab your lunch from Atlanta’s best food trucks every Thursday starting April 7, 2011 between 11am – 2pm. I honestly can’t remember a time when Houston’s wasn’t around. It seems like my family always went there, specifically the location across from Benihana in Buckhead. Always a large party for us, we’re usually split into side-by-side circular booths—as parties larger than 6 are a challenge at every location. Generally we start with the Chicago-Style Spinach and Artichoke Dip. In my opinion: the Best in Atlanta. For me it’s the standard by which I measure every other version of spinach dip anywhere. It comes with additional dishes of sour cream and salsa. As a kid I would stir all three together and dip my tortilla chips into the greenish-pink concoction it made on my plate. My mother always gets the Traditional Salad with Hot Bacon dressing. Simply made with eggs, bacon and croutons– it was the first restaurant salad that I ever loved. Even now, my mother has no choice but to share a small portion of it- as it is entrée size. I sometimes start with a bowl of soup, but usually the dip and salad are enough. And by the time the entrees arrive I can eat half and take the other half home with me. You do not want to leave food that good behind. So what entrées do I recommend? My first choice is the Hawaiian Ribeye. This sweet and savory steak that almost tastes like teriyaki is probably my favorite steak at any restaurant. My second choice is the Gulf Coast Fish Sandwich. I can’t even describe how surprised I was when first tried this sandwich. This is my favorite fish sandwich as well. And my third choice is usually whatever the Chef’s Special is that day. It’s usually a safe bet. While I highly endorse certain dishes, the truth is that I’ve never had a bad meal at Houston’s. Its usually a case of like versus love. Everything is well seasoned and well presented. Plus the ala cart portions don’t leave anything to be desired. So enjoy. I recommend a family visit. Share the love!